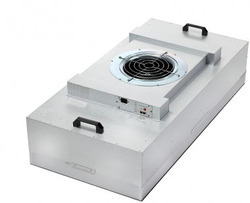 Manufacturer of a wide range of products which include fan filter unit. Owing to our expertise and immense knowledge in the field, we are instrumental in offering a comprehensive array Fan Filter Unit. The offered product is mainly used for protection against contamination introduced from various sources, such as personnel, general work area, manufacturing, etc. This product is extensively demanded in the industrial sector, commercial sector and residential sector. These filter units are designed using best raw material and contemporary technology under the vigilance of adroit professions. Moreover, our customers can avail this at reasonable prices. Looking for Fan Filter Unit ?